It’s beginning to look a lot like Christmas… At least it has on Irish and UK television stations. Irish co-productions ‘Ripper Street’ and ‘Loving Miss Hatto’ will premiere over the Christmas period on BBC, as well as a Christmas special of Brendan O’Carroll’s ‘Mrs Brown’s Boys’, while Ian Fitzgibbon and Dylan Moran’s ‘Little Crackers’ will air on Sky One. The BBC unveiled its Christmas schedule earlier this month, but was narrowly beaten to it by a seasonal savvy Channel 4 which announced its Christmas season as early as October. Sky got in on the action three weeks ago after revealing snippets of information for the last few months, and Ireland’s own RTÉ is kicking off its yuletide timetable tonight with viewers’ favourite ‘The Late Late Toy Show’. 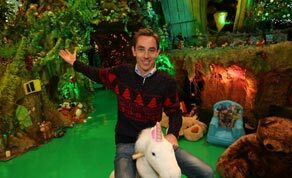 Ryan Tubridy will return to our screens tonight from 9.35pm, complete with Christmas jumper and kids galore, to give parents an insight into the gift options out there this year. The highlights in the BBC calendar include the first episode of the Irish co-produced ‘Ripper Street’, a 19th century-set drama set in the aftermath of the Jack the Ripper murders. The eight-part series will kick off on BBC One over the Christmas period, with Irish actors Charlene McKenna and David Wilmot joining the primary cast of Matthew Macfadyen, Jerome Flynn and Adam Rothenberg. Element Pictures co-produced with the BBC, Tiger Aspect Productions and Lookout Point in the UK. Another Irish-shot drama, ‘Loving Miss Hatto’, which charts the real-life story of pianist Joyce Hatto and her husband, who pulled off the greatest fraud in classical musical history, will also air on BBC One. Ireland’s Octagon Films produced with the UK’s Left Bank Films, with Irish woman Aisling Walsh directing. Rounding off the BBC dramas are entertainment shows in the form of BAFTA-winning sketch show ‘Mrs Brown’s Boys’, in which Agnes is tasked with finishing decorating the Christmas three while preparing dinner for all the family; the ‘Strictly Come Dancing’ Christmas special, which will feature a host of celebrities ballroom dancing for judges such as Len Goodman and Bruno Tonioli, and a new series of ‘Miranda’, which sees the title character start off the new season with a new job. Channel 4 will air the season two finale of ‘Homeland’ over the Christmas period, just after RTÉ airs it that prior Tuesday. TV chef Gordon Ramsey will serve up some live cooking in ‘Gordon Ramsay's Christmas Cookalong Live’, in which he’ll guide you through Christmas dinner step-by-step, and comedy is covered with a ‘Friday Night Dinner’ Christmas special, in which Adam is confused as to why his Jewish family is celebrating Christmas in the first place. Alan Carr gets the party season started on Channel 4 with his ‘Chatty Man’ Christmas and New Year specials, while comedian Jimmy Carr is back with a 2012 version of ‘The Big Fat Quiz of The Year’. Sky has already announced it will air all eight Harry Potter films and every film from the James Bond franchise prior to ‘Skyfall’ on its on-demand service over Christmas. Also on its December diary is Sky One’s ‘Little Crackers’ season, in which Irish actors Sharon Horgan, Tommy Tiernan and Dylan Moran star in, with ‘Death of a Superhero’ director Ian Fitzgibbon behind the lens. Sky One continues its comedy slate with new episodes of ‘Spy’ and ‘Trollied’, and Sky Living will air a new series of ‘Mount Pleasant’ as well as reality show ‘The Love Machine’. Irish and British audiences will be treated to a host of new and classic films over the Christmas period, such as ‘The Muppets’ on Sky Movies, ‘City of Ember’ starring Saoirse Ronan on Channel 4, ‘Mr Stink’ on BBC, and ‘Bad Santa’ on TV3. ‘The Late Late Toy Show’ kicks off at 9.35pm tonight (November 30) on RTÉ One, featuring over 200 performers and participants who attended at RTÉ studios. See RTÉ, TG4 and TV3's Christmas schedules here.